Are you one of the many adults considering braces to improve your physical appearance, bite, and dental health? There’s more to braces than simply looking good. Orthodontic treatment is also an investment in physical wellbeing, emotional health, and social confidence. A healthy bite is just as important at age 60 as at age 16, perhaps more so. And, the position of healthy teeth can be altered at any age. Misaligned teeth leave the teeth and gums at risk for gum disease and cavities, which can lead to other expensive dental work such as fillings, root canals, implants, and dentures. Left untreated, misaligned teeth can cause migraines, earaches, and even heart disease! These are only some of the reasons that A Supa Smile is happy to put braces on our clients, regardless of age! Orthodontic treatment at later stages in life can dramatically improve your personal appearance, self-esteem, and the health of your teeth and gums. Adult braces are now more convenient and comfortable than ever! 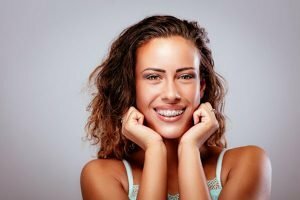 New techniques and appliances greatly reduce discomfort, decrease the frequency of visits, shorten treatment time, and may allow you to choose from several options including ceramic braces, lingual braces, or transparent aligners. Some adults are hesitant to undergo the treatment because they imagine that orthodontic braces are for younger patients only, and they don’t want others to notice the braces. Fortunately, there are various types of braces available, and if you are uncomfortable with traditional braces, you can consider other options that blend with the colour of your teeth and ones that are virtually invisible. Ceramic Braces: Ceramic braces are the same size and shape as metal braces, except that they have tooth-colored or clear brackets that blend in with teeth. Some even use tooth-colored wires to be even less noticeable. Pros: Less noticeable than metal braces; move teeth much faster than clear plastic aligners. Cons: More expensive than metal braces; Brackets can stain easily if patients don’t care for them well. Lingual braces: Lingual braces are the same as traditional metal braces, except that the brackets and wires are placed on the inside of teeth. Pros: Invisible from outside the mouth. Cons: Difficult to clean; more expensive; not appropriate for severe cases; can be more uncomfortable at first; regular adjustments take longer and are more difficult than with traditional braces. Invisible braces: What they are: Multiple, clear, molded plastic upper- and lower-teeth trays that fit your teeth through each straightening stage, which is about two weeks per set. The number of trays, or “aligners,” depends on how much straightening you need. Pros: These braces are almost invisible. Clear braces are smooth and comfortable. They do not have sharp edges or protruding edges or bits. They’re easy to clean, partly because you remove them before eating. Because they can be removed you can brush and floss your teeth without any trouble. Cons: Not for folks with major straightening needs. These are the most pricey braces. Invisible braces are not effective on extreme orthodontic problems. Invisible braces are also the most likely to be lost and costly to replace. Finally, treatment may potentially take longer. Just as younger patients can, adults can benefit from orthodontic care. Though the result is not as quick as with cosmetic dental procedures, you can be certain that once it’s complete, the result is completely worth it. A beautiful, straighter smile, which makes you look and feel good every time you smile with your perfectly aligned teeth. Improved self-confidence as the treatment brings your teeth, lips, and face into proportion, which makes you feel good about the way you look. Support of other restorations. Dental braces can enhance the results of restorative dental work such as dental implants. A Supa Smile is conveniently located just off of the Maroondah Highway with public transport nearby. For working patients we are open from Mondays to Saturdays, morning until evening. Emergency dental treatment is also available! Contact us on (03) 9723 0703 or book your appointment online to claim your FREE Braces Consultation today!